Bulky, heavy and often large, humidors aren’t exactly the ideal travelling companion. However, lightweight and robust travel humidors are made for exactly that. Whether you’re commuting, taking a plane or climbing a mountain, travel humidors are designed to safely hold your cigars for when you need them. Why Buy A Travel Humidor? You can scroll down to keep reading or use the above links to jump ahead. What Are The Best Cigar Travel Humidors? Travel humidors are a particularly unique breed that are designed for only one thing. As the name suggests, travel humidors are designed so that you can conveniently transport them with you. Therefore, they’re not for long-term storage but short periods of transit or stays away from home. Nevertheless, travel humidors aren’t exclusive to jetsetters and can be an invaluable tool for even the shortest trips. For instance, if you’re heading out and want to take some cigars with you, they offer the best protection and environment for your cigars. While small cases tend to be quite attract, travel humidors are more robust and will provide more space. Whether you’re heading to an event, seeing some friends or you’re even buying cigars from a shop, they’re a great way to transport them safely. As such, travel humidors are a very useful accessory for every cigar enthusiast. In order to fulfil their function, travel humidors need to fulfil certain requirements. Firstly, they need to offer and airtight seal so the necessary interior environment can be created. If they’re not airtight, they won’t retain the moisture provided by the humidifier. Furthermore, the humidor should be made from lightweight materials that are easy to carry. Yet, the materials need to robust enough to resist shocks or being crushed. Similarly, superior travel humidors are not only extremely crush proof but also waterproof. After all, you never know what could happen when travelling and it’s certainly a reassuring feature if you’re heading out to the beach. All travel humidors should have strong latches to prevent accidental openings when carried or in your luggage. Meanwhile, some larger quality humidors will also feature locking mechanisms with combinations or a key so they can be securely stored without fear of wandering sticks. Finally, some of the better, more advanced travel humidors will feature safety valves for air travel. Given that you may be leaving them in your checked luggage, you can open the valve beforehand to avoid the box breaking under low pressure. Admittedly, travel humidors are usually less than perfect, which is why we generally don’t recommend them for long-term storage. As they’re essentially hard cases with added rubber seals, few of the travel humidors that we’ve tested actually have truly airtight seals. As such, they tend to underperform and are really only viable if you intend to smoke the cigars sooner rather than later. However, this doesn’t necessarily speak for all travel humidors are there are some good ones on the market. Just make sure that you’re buying quality rather than an attractive design or low price. Another common issue among travel humidors that they tend to offer little storage space compared to their size. Unfortunately, this is partly out of necessity. The majority of travel humidors are filled with Ester, Polyethylene, or Pro-Cell foam to secure and cushion the cigars. However, this is a double-edged sword is it leaves little space is left for the cigars themselves let alone the humidifier or hygrometer! Nevertheless, the foam has an important function in that it prevents the cigars from being loose inside the container, which could cause them to damage one another. Still, this may sometimes results in not having enough space for your cigars. Consequently, people may try to overfill their travel humidors, we could actually crush them from the inside! When looking for a travel humidor, consider reading some of our tips to make sure that you buy the right one to suit your needs. You’ll notice that we actually feature the One-Year Boveda Humidor Bag as a recommended travelling solution. At Bespoke Unit, this is actually one of our favourite and cheapest ways to correctly store cigars when travelling. As they’re available in a number of different sizes, you can store as little as a few cigars to even a couple of boxes in a single bag. When travelling with entire boxes, you can easily slip these in a larger bag, which is perfectly secure in itself. However, if you just have a few cigars, simply put them in a smaller bag and then place the bag itself in a harder box for protection. Not only is this perfectly sufficient but it offers a better environment for your cigars than most travel humidors. Finally, despite their appearance, Boveda bags aren’t simply branded ziplock bags with an included Boveda pack. In fact, they’re made from barrier-laminated plastic with an airtight enclosure. Meanwhile, regular ziplock bags do lose moisture over time and aren’t as reliable as we like to think. Otherwise, you could even consider a small tupperdor for travelling. While less attractive, it’s certainly cheaper and more effective than the majority of travel humidors on the market. If you do decide that you absolutely want a travel humidor, you must first and foremost inspect the seals. Unfortunately, this isn’t always possible before you buy one, but you can always return it if you find that it doesn’t offer decent performance. The best way to do this is by simply throwing in a humidifier with a hygrometer and closing it. Once set up, periodically check the humidity to see whether it’s consistent. If it’s too low or fluctuates, then you likely have a leak. Of course, the humidifier may be over-performing in order to compensate for the leak and you may not notice a drop in relative humidity. Therefore, the best way to do this is over a long period of time as we did with ours. Another way that we wouldn’t recommend is by filling it with water. Sadly, this may actually ruin the travel humidor or it’ll need to dry off afterwards. Yet, it does yield good results as you’ll be able to see if it leaks water when closed and held to its sides. If it retains water, then there’s a good chance that it also holds air. Finally, the quickest and easiest way to check the seals is by closing it and giving it a squeeze if made from ABS moulded plastic. If it hisses when squeezed, then it’ll likely leak air even when under no pressure. Finally, consider checking the latches as well as the seals. Some cheaper travel humidors come with loose or weak latches that break. If the latches are unreliable, there’s a high chance that the humidor could pop open and expose the cigars. Ester: Probably the best foam for cigars, Ester offers an excellent cushion that protects delicate objects that can break under impact. Its cushioning is flexible an can store irregular-shaped objects. Polythylene: Absorbs more shock than Ester and made for heavier objects, PE is a great foam for most uses. Pro-Cell: With its refined finish, Pro-Cell is better for displays. It’s more delicate than the other foams but is surprisingly dense. There are also different cuts and shapes to the foam. You can opt for foams that have a flat finish, which is generally better for smaller, flatter humidors. Otherwise, there is also the convoluted, egg-crate shaped foam offers better protection. Some travel humidors may actually have piped foam to give you a pre-shaped space for placing your cigars. Probably the most essential step when using rather than buying a humidor is your choice of humidifier. Even a quality travel humidor can be let down by a poor humidifier. Meanwhile, an inferior humidor may actually perform well with a strong humidifier. Firstly, the humidifier needs to be compact because of the small space available. As mentioned above, there is usually little space for the cigars themselves so a chunk humidifier may take up too much. Meanwhile, traditional humidification devices are usually charged with liquid whether they’re based on gels, beads or foam. As such, they may have a tendency to leak all over your cigars. Last but not least, most of these traditional devices offer only one-way humidification. This means that they continually release moisture close to them, which doesn’t diffuse. This can easily cause over-humidification is such a small and, hopefully, airtight space. As such, two-way humidification ensures that excess moisture is absorbed when the humidity goes over a certain level. Meanwhile, it will diffuse it only when necessary. For all the reasons mentioned above, we largely favour Boveda’s humidity packs. Not only do they come in more modest sizes for travel humidors but they also completely hassle-free. Their membrane lining is very hard-wearing and resistant to breaking and the packs provide a two-way humidity control. Their small 8g Boveda humidity packs are conveniently sized and provide enough humidity for 5 to 10 cigars. However, we tend to go for the typical 60g humidity packs as they’re still relatively small and tend to offer the best performance and value for money. Finally, we’ve already mentioned several times that travel humidors have a deceptively small storage capacity compared to their size. As such, it’s always worth keeping this in mind when buying your travel humidor. Firstly, their labelled count capacity may refer to smaller vitolas than you’re intending to carry. It’s quite disappointing to find that your case can only carry 5 robustos when you want transport 6 Churchills! Secondly, you may only want to carry a few with you when buying the humidor. However, you may want to carry even more in the future. 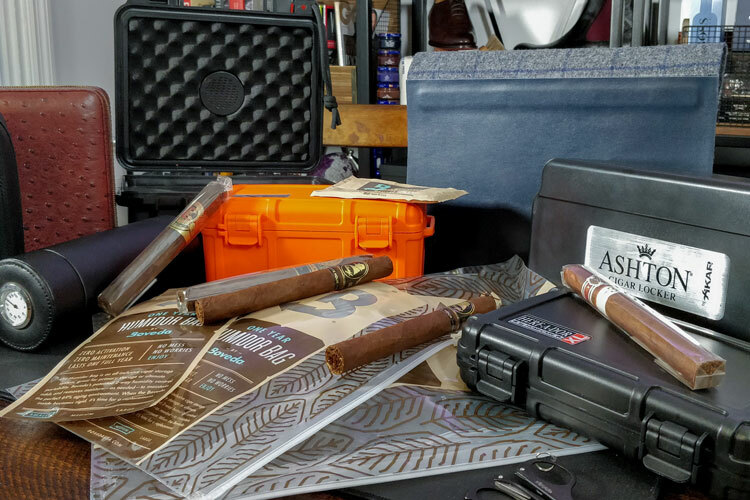 Unless you’re planning to buy a different travel humidor for every possible scenario, consider buying one that can contain more than you need. Finally, care should be taken not to overfill a travel humidor. If you compress the foam too tightly, it would absorb shock but put the cigars under unnecessary pressure. An overfilled travel humidor may even crush the cigars if you’re not careful! Unless made from cedar, which will require seasoning, travel humidors are generally very low maintenance. Our only advice would be to place your humidifier inside the humidor a short time before placing the cigars. This ensures that the environment is well-prepared and that the foam can absorb any humidity if necessary. A remarkably heavy duty yet lightweight travel humidor, the FireKing ST series offers excellent protection. They’re able to carry 16 or 33 cigars depending on the size and feature complete waterproof protection. The seal is excellent and can be locked with a key as well as dual compression latches. There’s no hygrometer so you might want to add a small one but there is an integrated Boveda pack holder, which we think is perfect. While not strictly a travel humidor, Boveda’s humidor bags are very versatile indeed. The small version can contain three or four cigars while we’ve managed to squeeze several boxes in the larger ones. Indeed, these don’t offer much in the way of protection. However, either fit an entire cigar box in a large bag or even place a smaller bag in another container. 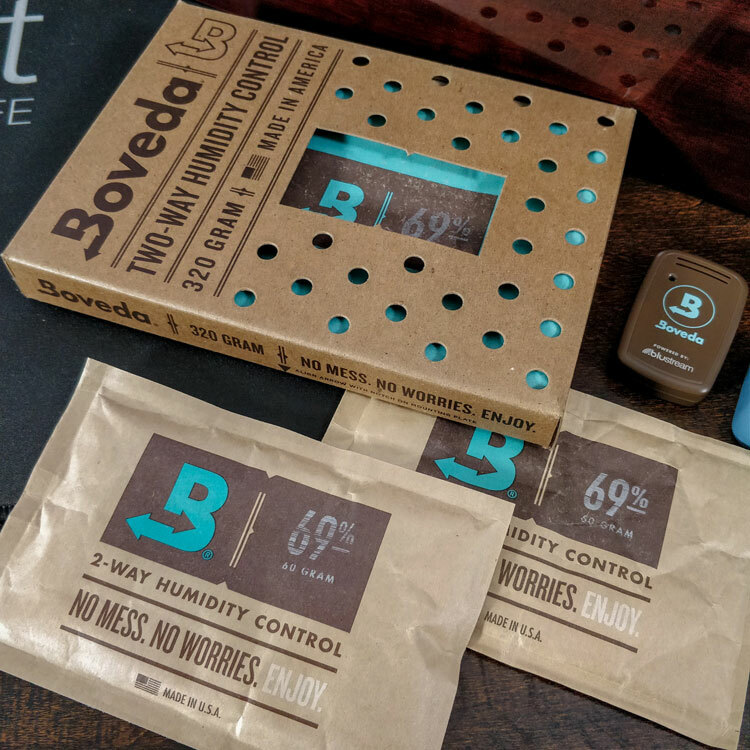 As they come with Boveda packs, they’re fully equipped and can provide a year’s worth of humidity if used correctly. 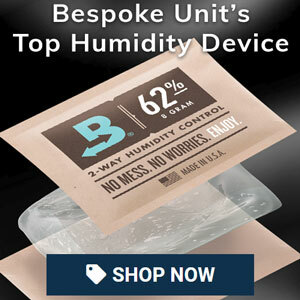 We regularly rely on Boveda’s humidity packs as reliable and cheap storage. As such, we can’t rate them enough! Davidoff’s lavish Italian-made travel humidor is constructed from knitted Jacquard fabric and leather that is welded together for an airtight seal. A pull-out tray is designed with a flexible wave design to protect each cigar while a hidden magnetic clasp seals it shut. 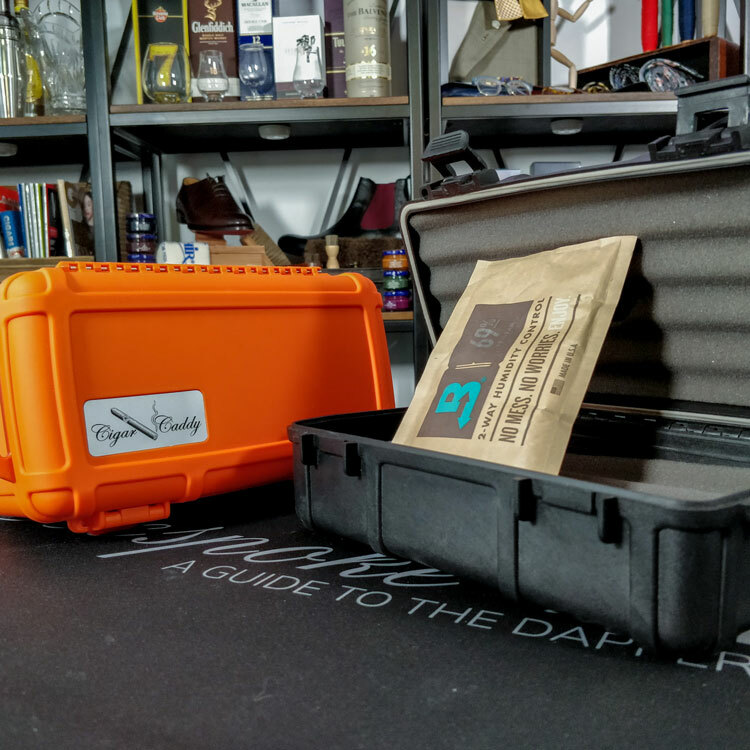 Davidoff travel humidors used to be supplied with their own humidity packs, which has since been replaced by those made by Boveda. The above one pictured is a limited Churchill edition but there are plenty of other designs available. 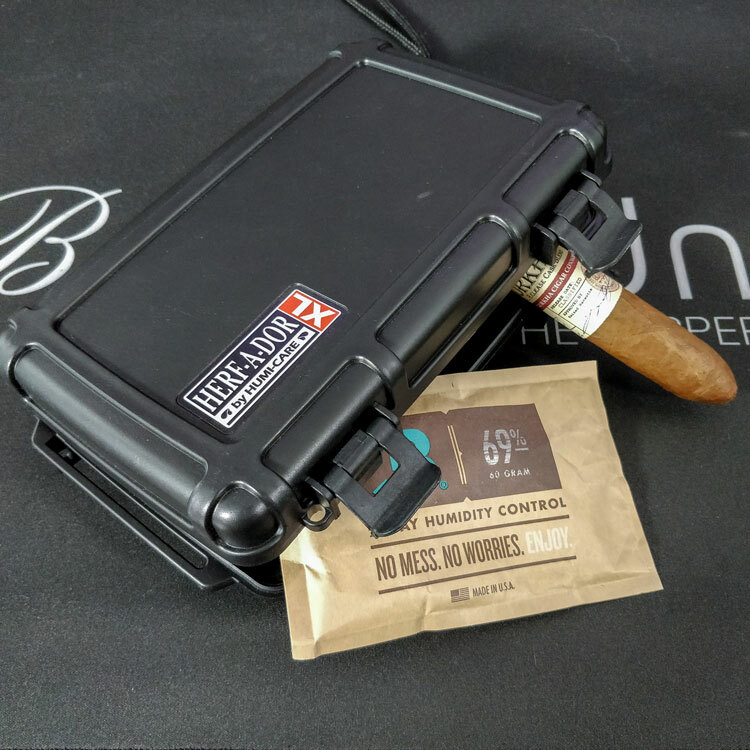 A more reasonably-sized luxury travel humidor, the Colibri Explorer offers a superior seal than the more affordable Lagute below. Capable of holding up to 12 Churchill cigars, it is made from Saffiano leather. If you’re planning to attend an event where you’ll be smoking cigars, the Lagute Goucho is an excellent accessory. Unlike other travel humidors, it’s very elegant with its leather exterior and cedar wood lining. However, this isn’t ideal for storage over a long period of time. Firstly, it’s limited to only 6 cigars, which isn’t very many. While the zipper and seal on this are better than most leather cases, they aren’t airtight so some moisture will escape over time. If you’re looking to transport a large quantity of cigars, Xikar’s 50-80 travel humidor is an excellent choice. Crush proof and airtight, the high density urethane foam carefully protects your cigars. We’d throw out the foam humidifer supplied with this and replace it with a few 60g Boveda packs. Remember to use one for every 25 cigar capacity as mentioned above. 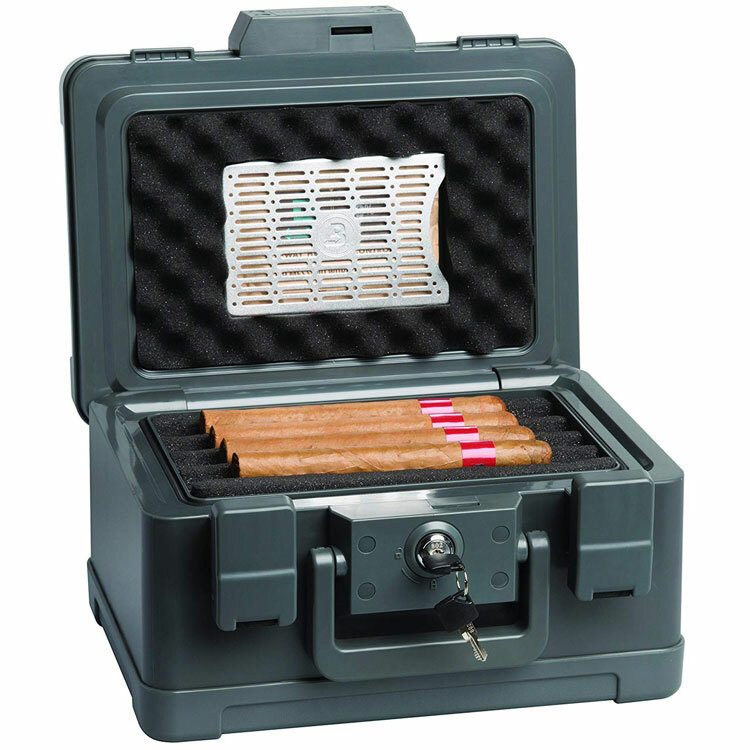 Otherwise, this is probably the best heavy duty travel humidor for large quantities. One of the most common travel humidor designs that was popularised by Herf-a-dor, Cigar Caddy is probably one of the most reliable today. With it’s airtight seal, it floats on water but is still waterproof up to 100 feet. We would recommend this larger one that can contain 15 Churchill cigars as the smaller models provide less versatility in terms of storage. 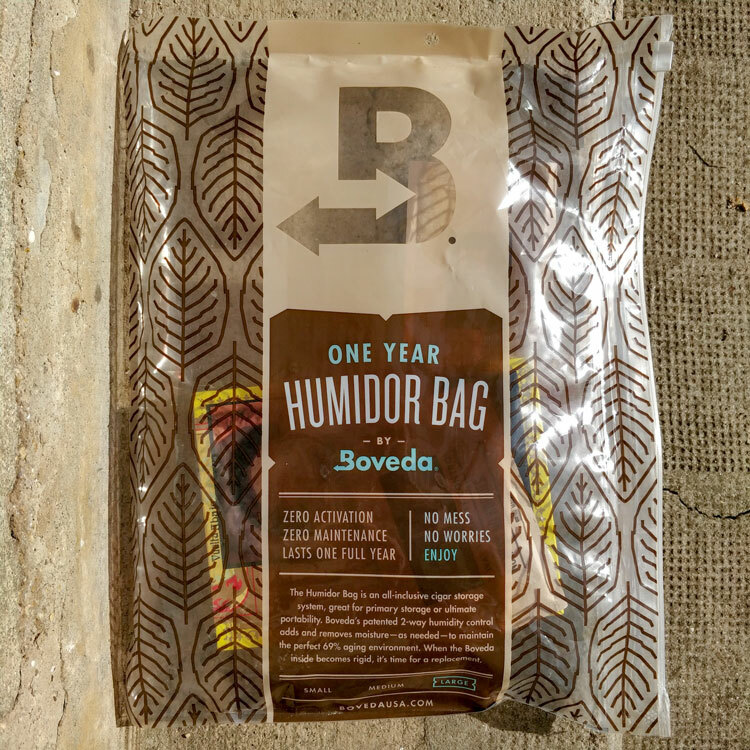 Furthermore, we don’t use the supplied humidifier but rely on Boveda packs instead. This is another great travel humidor for attending events. It offers a great seal and its cedar lining absorbs some moisture for long-term performance. However, we’re not sure if it’s Spanish cedar so don’t expect the same benefits. While it can contain up to 5 cigars, this largely depends on the vitola. We find that it’s complicated with larger-gauge cigars and you’ll probably only fit two or three cigars above 50 RG. We also threw out the foam humidifier and just use Boveda packs. This also helps cushion the cigars and prevent them from rolling around inside the tube. This is also the only travel humidor with a hygrometer. While the analogue hygrometer isn’t going to be very accurate, it’s still a nice decorative touch and gives you a fair idea when calibrated. Now that you know everything you need about wooden humidors, why don’t you check out some of our related content for better cigar storage? Reviewed by Geoffroy O., on 19th October . "A great help! Was looking to travel and found what I needed here."